Some of Stanley’s bench planes had foundry markings on them to identify which foundry the plane was cast in, typically subcontracted by Stanley. This is indicative of the Type 7 planes manufactured from 1893-1899 which has an “S” marking – some speculate this is from the Session Foundry in Boston. On the bench planes it is found on the bed, frog and sometimes the lever cap. The Type 8 Stanley’s (1899-1902) eliminated the “S” castings, but had a “B” casting, which again disappeared by the time the Type 9 appeared in 1902. So how does this translate to block planes? Well, it gets kind-of muddy here because while Stanley block planes do sometimes contain foundry markings, there is very little information with respect to whether there is a correlation with the bench planes. Foundry markings on most plane bodies are hidden. In bench planes they can sometimes be found in the bed, under the rear handle. In block planes it is harder to hide markings, so they can often be found on the surface of the adjustable mouth plate, where they would be hidden in normal use, and only revealed when the plate is removed from the plane. 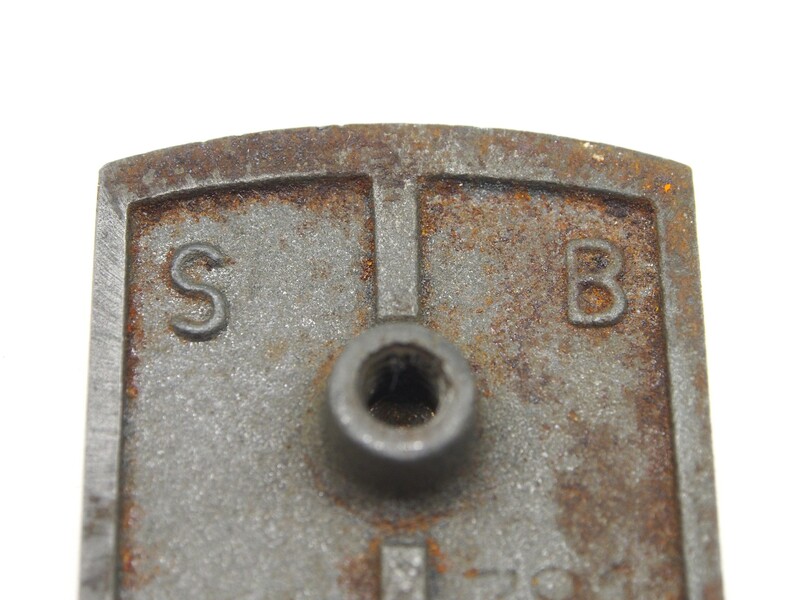 Here is an example, showing two foundry markings, both “S” and “B” – which doesn’t really give any clarity to the situation. The second rust removal experiment I performed using Restore Rust Remover Gel. This gel contains both etidronic acid, and trisodium nitrilotriacetate. Both are chelating agents, pH neutral. For testing the gel, I used the sole of a plane body covered with rust. The choice of a plane body for the gel makes sense, as it is most likely that the gel would be used for larger objects, that can’t be submerged in a liquid, e.g. saw blades. To test this gel, I brushed a layer of it onto the sole of the plane, which has quite ingrained rust. I split the sole in half using painters tape. The instructions say that “Application is by means of a scouring pad (not supplied) which is moved gently over the surface until the rust is removed and the surface is left bright and clean.”. This is not a “thick” gel, I would agree with the manufacturers description of a “thickened liquid”. First off I thought I would test leaving the gel on the plane for 20 minutes. The gel applied, and the scouring pad used. The end result was that the gel actually dried in 90% of the test area, so obviously the best approach is to scrub. I then followed the instructions exactly, using an abrasive “Chore Boy® Golden Fleece” scrubbing cloth. The results were… underwhelming to say the least. Test 1: Before and after (the region below the white line). The orange flash-type rust was vanquished, as were the black regions. The deeper rust? Still there. Does this product actually remove rust? Maybe, the kind of rust that is surface rust, and may be just as much attributed to the scouring action than to the gel itself. For all the scouring action involved, it would have been easier to sand the sole down. Just to be sure I wasn’t going crazy, I tried a second test on another block plane sole (I have a bunch of these relics in a box – think spare parts). 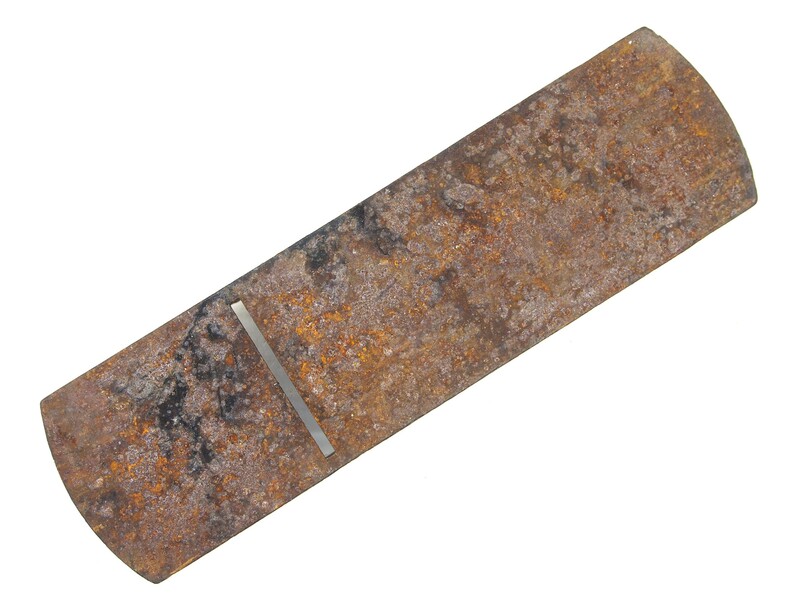 The rust on this sole was much lighter, and it was possible to still see steel. The results show less surface rust, but were again, not great. Test 2: Before and after (the region below the white line). After two tests that didn’t really produce the results I had hoped, I would not use this product, nor recommend it. There is also a liquid concentrate for soaking which makes 5 litres of solution, which I did not try. In reality, both products are C$39.50 which is super expensive. A litre of Evapo-Rust is C$14.50 (and a 5 gallon pail (18.9l) is C$108 on Amazon.ca). Here is a photo of the sole of the first plane, to give an overall perspective. 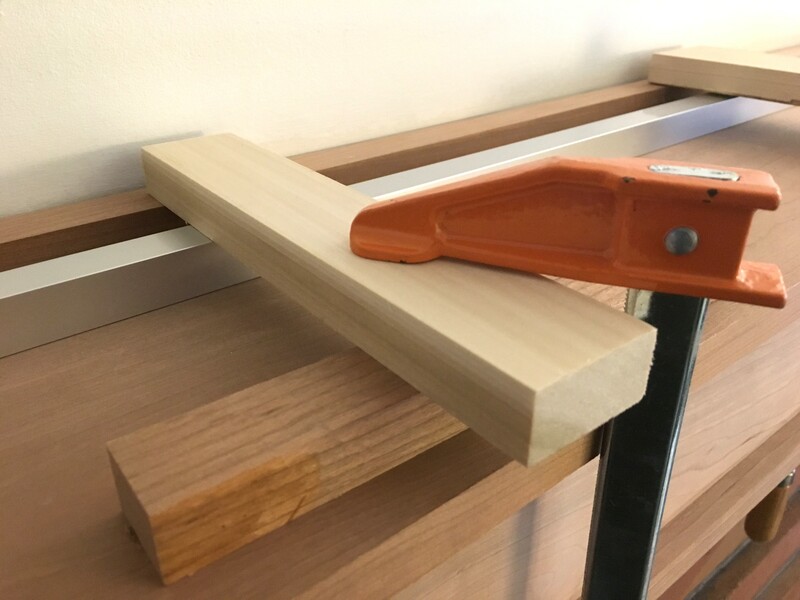 The last step in the mantel build was gluing on the top panel. This involved a Herculean amount of clamps. 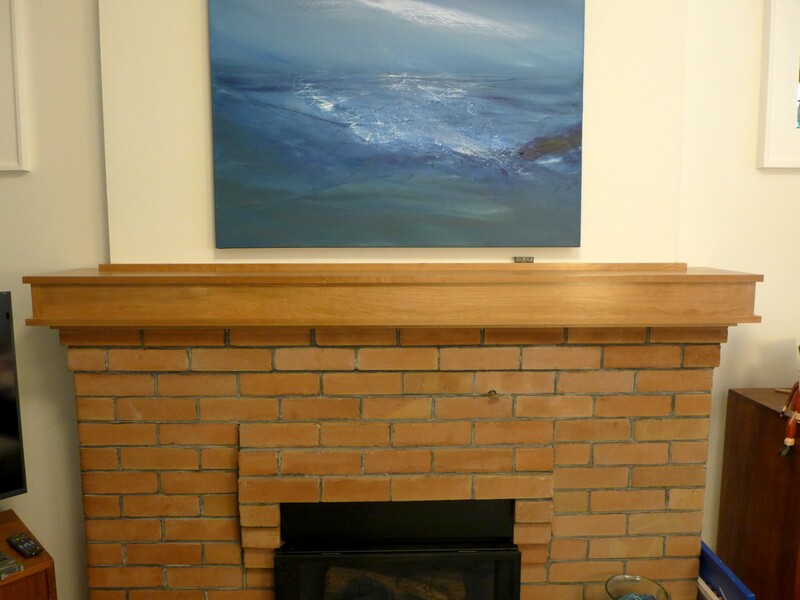 Here is a picture of the completed mantel. 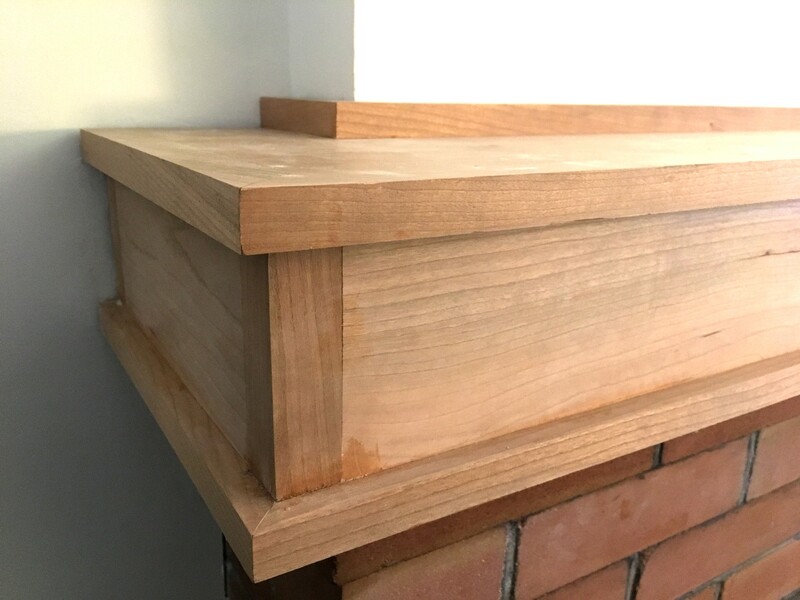 The top of the mantel also received a piece of trim where it intersects the wall, and because the wall wasn’t exactly straight it required a bit of ingenuity to ensure it was straight with the front of the mantel. And a further bit of out-of-the-box clamping to hold it in place while the glue dried. 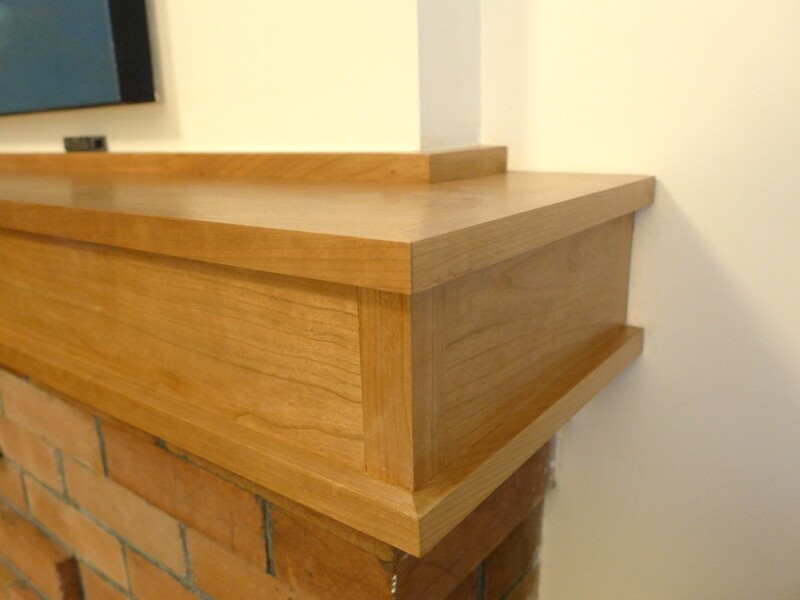 Here is one end of the mantel before the finish. Just required a bit of sanding, and three coats of finish. For a finish I used General Finishes, ENDURO, water-based urethane (satin). The cheery will darken up over time, and hopefully the mantel will last another 90 years! Sometimes you find things just by accident. I downloaded the latest copy of Australian Wood Review, and there was a review of a honing guide made in Australia. Over the last few years there have been a bunch of tools that have appeared, designed and manufactured in Australia. There include HNT Gordon & Co., and Colen Clenton marking out tools. I bought tools from both toolmakers in the late 1990s, so it’s nice to see they have flourished. This honing guide comes from Henry Eckert Toolworks, and is manufactured in Adelaide. These are modelled on the old Eclipse guides, but are manufactured using “solid cast gunmetal bronze, marine grade stainless steel and brass”. 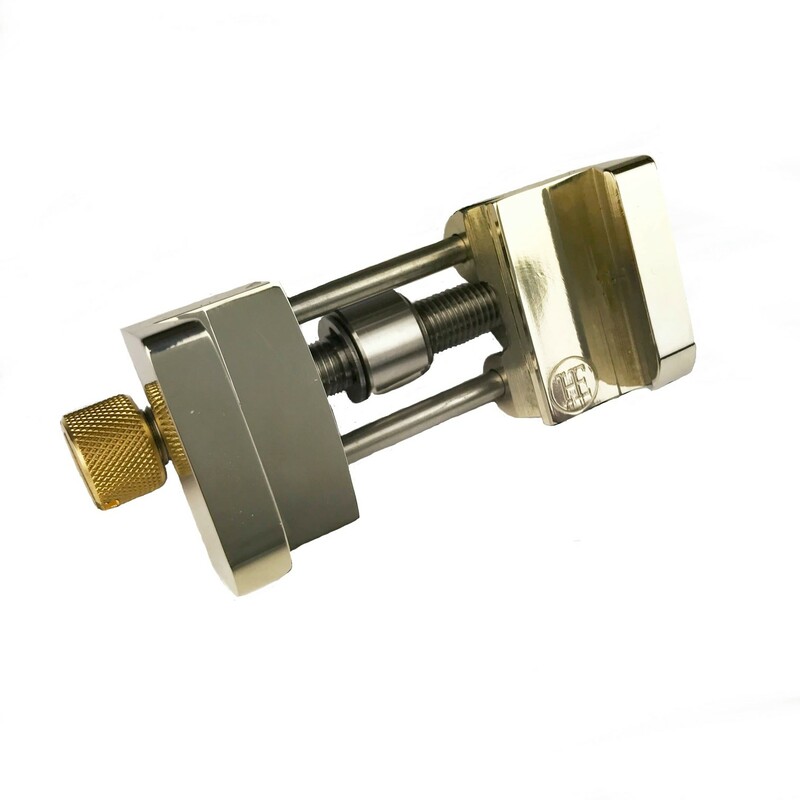 It looks like an amazing tool, (selling for C$133), well designed, with three different clamping jaws to accommodate chisels and plane blades as small as 3mm (1/8″). It looks like a nice competitor to the other two major players on the market: the Veritas Mark II honing guide, and Lie-Nielsen’s honing guide. Both have pros and cons – the Veritas guide sometimes seems overly complex, and the LN guide can get expensive as more guide jaws are added. This honing guide is well designed, and seems like a quality product, that harks back to a more simple design. 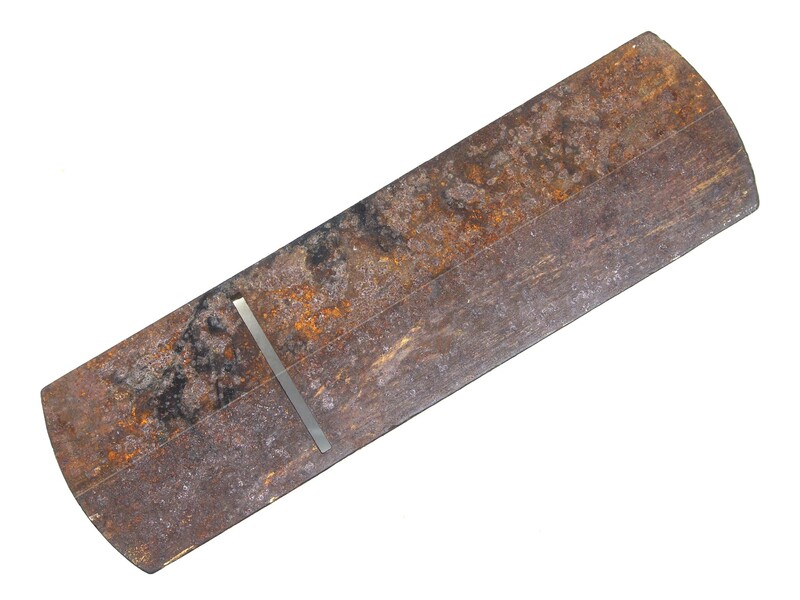 They also sell an angle setting jig to help easily set up blades for sharpening. An issue of Mortice & Tenon magazine. Robert Penn‘s book, “The Man Who Made Things Out of Trees”. Just about any book from Lost Art Press, like The Anarchist’s Design Book. 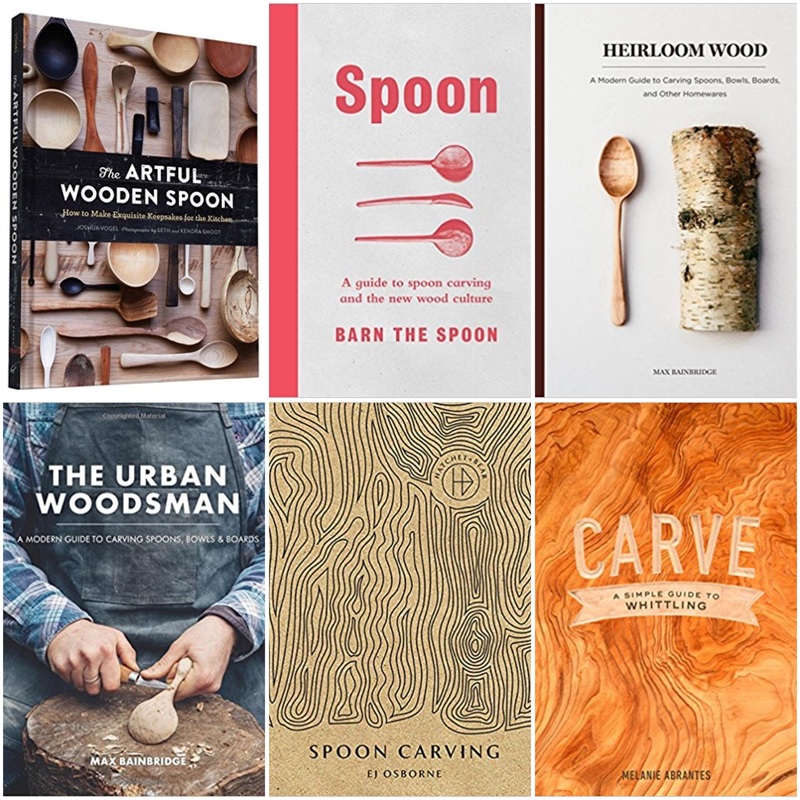 One of the myriad of books on spoon carving, and there are a *lot* at the moment. I am yet to find a poorly written one. A Japanese mill-tooth file (Lee Valley). I wrote a brief review on these, and I can’t get over how incredibly useful this tool is. A wooden rule. Available in 24″, 36″, 48″, 60″, and 72″ lengths (Lee Valley, Highland Woodworking). When is it not useful to have a long wooden rule floating about? A Lie-Nielsen No.102 bronze body low-angle block plane. A great little worker! Some Camellia oil for tool care, from The Unplugged Workshop. A carving knife to go with a book on spoon carving, and maybe a piece of easy-to-carve wood. I bought a couple of Mora knives from Bushcraft Canada. Also available from Canadian Outdoor Equipment. An axe. Yeah sure, a zombie apocalypse may not happen tomorrow, but an axe is something everyone should have at least one of. If you’re into carving then maybe more. Bushcraft Canada has a great selection of axes, including the Djarv handmade axes from Sweden. A Japanese saw, like maybe an all-purpose Nakaya Kataba BIG-1 from BigBear Tools. An Unplugged Workshop saw bench kit. A dripless glue bottle (Lee Valley), because everyone needs a better way of dispensing glue! 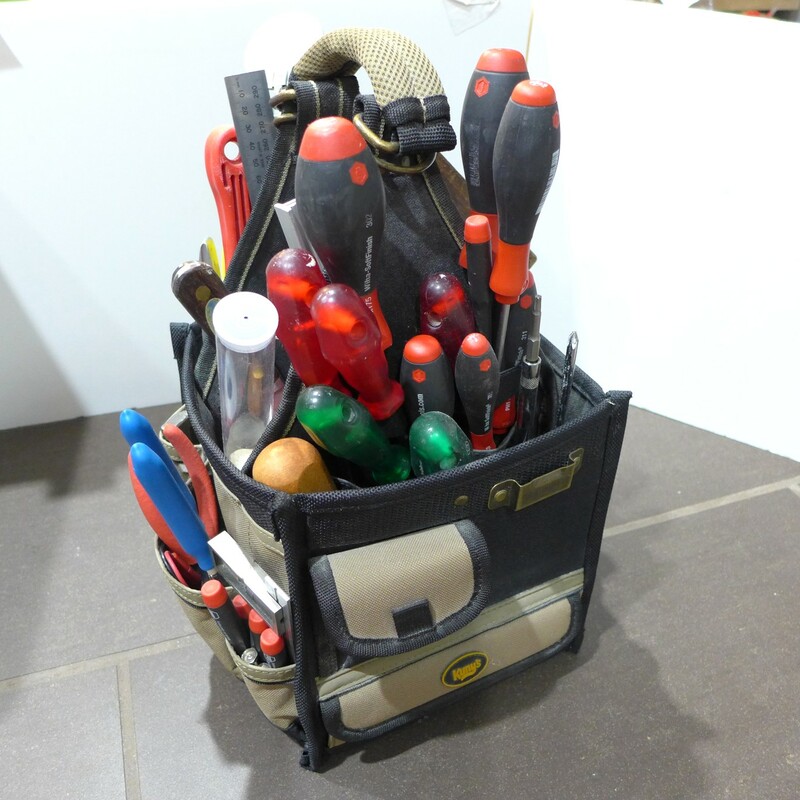 My tool carrier, filled with screwdrivers, electrical gear, pliers etc.